Two guns were seized after a search warrant on a downtown condo unit in the early morning hours of July 17. 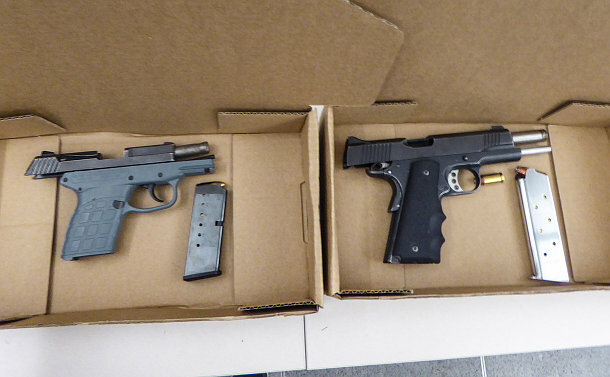 Two loaded handguns, a 9 mm and a .40 calibre, were allegedly seized from a search warrant near Front St. W. and Spading Ave. The Integrated Gun and Gang Task Force investigation led them to execute a warrant, with the Emergency Task Force, on a condo near Front St. W. and Spadina Ave. where they made six arrests after allegedly recovering two loaded handguns – a .45 calibre and a 9 mm. In 2017, Toronto Police recovered 725 crime guns, which are guns used in a crime, intended for criminal use, illegally possessed, or have their serial numbers obliterated. When the search warrant was executed, it is alleged that the people inside tried to flee to evade arrest. “Given that there allegedly were loaded guns in the place, it’s extremely fortunate that the officers were not injured during this search warrant,” Belanger said. Ibrahim Abdikarim, 24, of Toronto; Jabril Abdirahman 25, of Mississauga; Abdullahi Abdikarim, 22, of Brampton; Huseen Nur, 31, of no fixed address; Maya Ahmed, 26, of Toronto; Liban Guled, 28, of Richmond Hill, all face firearms charges.